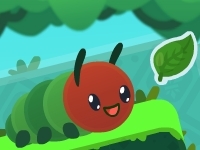 In Caterpillar Crossing we play as a little caterpillar we help to reach the ladder at the end of the level. Therefore we use the arrow keys or the finger and try to eat the leaves to grow and overcome the abyss with the help of this logic. In total there are 40 level with increasing difficulty.